Citibank launches first banking app for Kindle Fire | Android Blast! 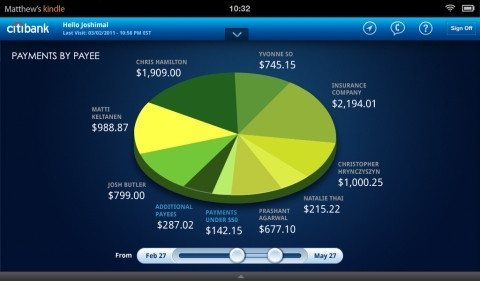 Citibank has released a version of its mobile banking app for the Kindle Fire. It's the first such banking app designed specifically for the Kindle Fire. It is the first app from a bank to have been built exclusively for Kindle Fire with every component, graphic, touch action, button and slider customized to the tablet�s modified operating system, form factor, screen size and resolution.